The most important form of marketing for any business is communication with their sphere of influence; clients, customers, friends, associates etc. It is a lot easier to get someone to buy from you or use your service a second time if they already know you. It is also more likely to get a referral from people who already know you than from a complete stranger. I don’t know the exact figure, but I would bet that almost without exception more than 80% of your business comes from repeat business and referrals. I work with many types of businesses and most use postcards either as addressed direct mail or as what is refferred to as “unaddressed admail” in their marketing. The majority of Realtors will tell you that 80% or more of their business comes from repeat clients and referrals, but for them “farming” an area or building brings new clients that are vital to growing their business. A lot of work goes into creating an effective postcard for farming. When clients want to cover an area of 2,000 homes there is a lot of competition to differentiate themselves from. Careful thought has to go into what you are sending. To make it easier to budget for direct mail I have developed an inclusive price list for clients that takes the guessing out of the cost. One measure of success of a good direct mail campaign is the length of time your marketing piece sticks around. 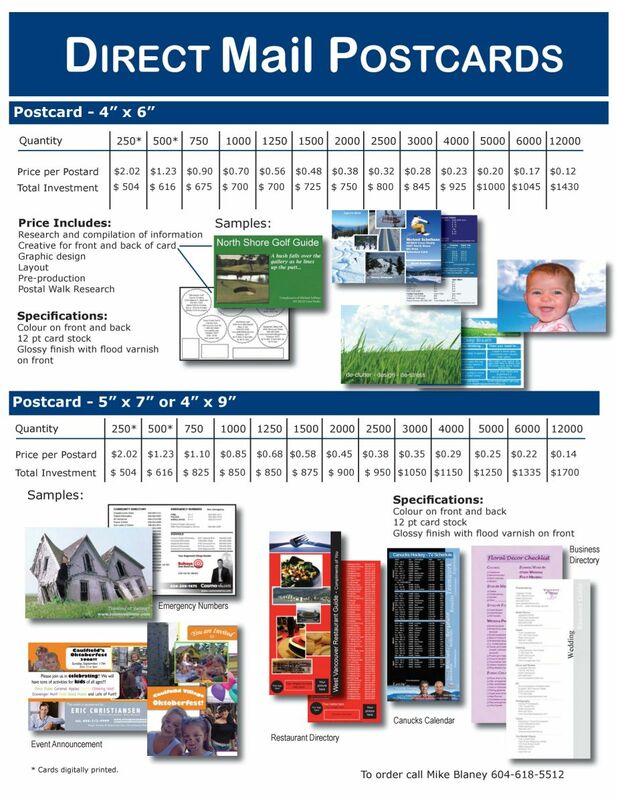 (see my article on refrigerator marketing) When you are sending 6 – 12 pieces of mail in a year there should be a cumulative effect on the reader. Over time you are building credibility and trust ad in the case of a Realtor you want them to consider you an expert in the area they live in. If you need any further proof feel free to call me at 604-618-5512 or 800-568-8338.